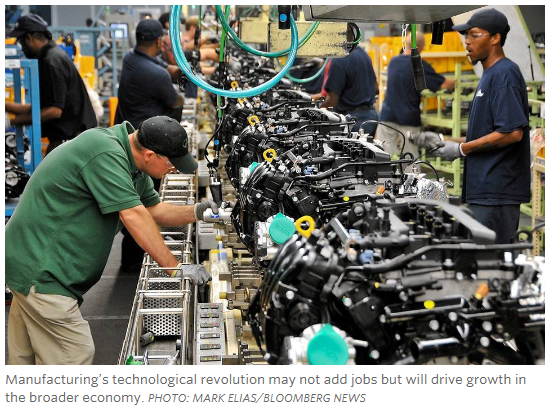 The Brookings Institution’s Martin Baily has an informative article, “what’s wrong with U.S. manufacturing policy,” in a recent issue of the Wall Street Journal. The internet of things in which machines are able to communicate with each other. Advanced manufacturing including 3-D printing, new materials and more accurate digital logistics. Distributed innovation in which crowdsourcing is used to find solutions to technical challenges more quickly. Government can further help with infrastructure improvements and expedited permitting processes. 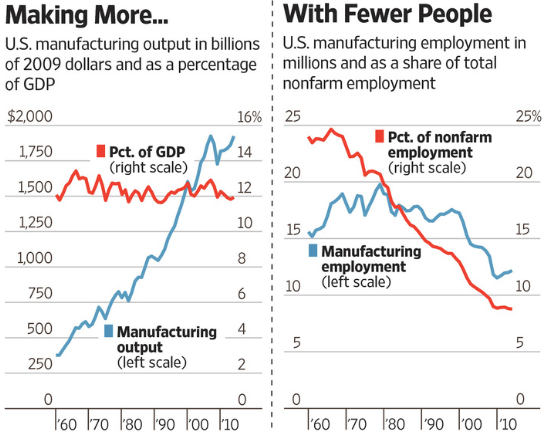 Conclusion: U.S. manufacturing will continue to thrive in a rapidly changing environment as long as it is properly supported with intelligent government policies. This entry was posted in Brookings Institution, economic growth, globalization, Jack Heidel, manufacturing policy, technology, Wall Street Journal and tagged economic growth, globalization, jack heidel, manufacturing policy, technology, Wall Street Journal by jackheidel. Bookmark the permalink. We are in agreement that “intelligent policies” from the government to support training for corporations might be helpful. However, we remain stuck in the late 19th century debate between Booker T. Washington and W.E.B. DuBois on the matter of training or educating as they sought solutions for the former slaves. Washington argued for technological training; DuBois contended that the entire person needed to be educated in order to be an equal citizen in America. Training people does not enable them to grasp the responsibilities of individuals and quality and dignity of living a satisfying life. Such education requires familiarity in the Arts, literature, religion and related areas as well. Community colleges simply put little or no emphasis on those areas. I agree with you that the liberal arts are essential for a complete education. A four year college degree will include study in these areas. And there are more and more students earning bachelor’s degrees all the time. But half of postsecondary students are attending community colleges. Some will transfer later to four year colleges but many will not. But they can acquire the high level skills needed for good jobs right where they are! Community colleges play a very important role in contemporary American society. I wish I had the faith you do. My experiences with community colleges indicate a declining pattern in any effort to encourage reading and writing; other than on the most simplistic levels. Speaking to administrators I often heard, “Well, we don’t expect the students will read the textbook!” Most teachers get by on objective tests because it is easily confirmed. Short term memory seems the aim not logical and orderly thinking. But for that matter I found a similar pattern at the university level. The use of on-line teaching only contributes to the absence of teaching and learning. Community Colleges serve two purposes, vocational training and transfer credit towards four year degrees. We have lots of back and forth between UNO and MCC on transferable credit, because MCC’s tuition charge is so much less than UNO’s. I am well aware that many students do not read text books, at UNO as well as elsewhere, but our best ones do. You’re probably aware of the recent book, “Academically Adrift” which shows how low academic standards are at most schools which certainly includes UNO. But students do what they need to do to graduate and then find suitable employment. Math majors do well in general and the best are quite well motivated. I think that middle class kids in general are succeeding in school but too many kids from low-income families are not. Better educational outcomes would do a lot to alleviate rising inequality and I’m not especially optimistic about how to accomplish this.